Local Angelinos and Long Beachers alike rejoiced at the recent announcement that Federal Transit Administration (FTA) will provide $670M towards the long-awaited underground Regional Connector light rail that lies at the heart of downtown Los Angeles. The proposed underground connector—consisting of about a two-mile stretch—will ultimately turn three lines—the Blue, Gold, and Expo lines—into two, providing Blue and Gold riders direct access to one another. This has been a longtime dream of many Metro riders—and, according to those at the press conference, given an estimated two-thirds of people in the county have no access to a vehicle (despite popular myth), the addition is welcome. Essentially, the Regional Connector allows two things. 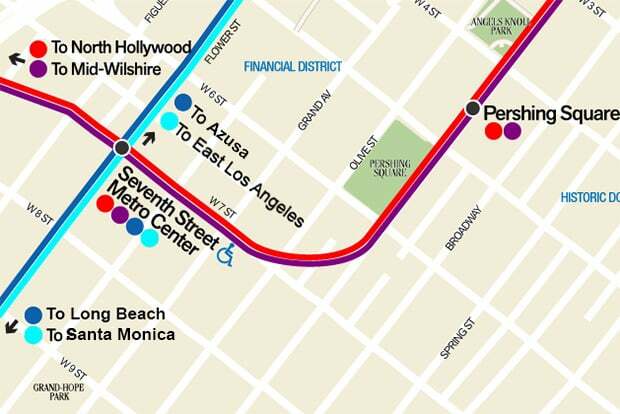 One, it will allow Long Beach riders to continue north to Pasadena and Azusa. Two, those from Culver City can continue all the way to East Los Angeles. All this without a transfer. Currently, Blue Line and Expo Line riders heading towards Los Angeles end their route at 7th Street and Flower in Downtown L.A., commonly called Metro Center since it is where the Blue, Expo, Red, and Purple Lines simultaneously meet. Two ideas had been previously proposed in 2009: an at-grade solution to connect the Blue and Gold, and an underground solution. The latter was overwhelmingly favored: it would not only garner more riders, but be much more efficient and less intrusive. That underground option would follow 2nd Street to Alameda, connecting existing three light rails in a wye or triangular function just slightly south of the Little Tokyo station along the Gold Line. In addition to the Connector itself—which is estimated to cost a total of $1.37B, part of L.A.’s first Full Funding Grant Agreement with the FTA in twenty years—will add four new light rail vehicles to the Metro fleet. Though a large portion of the project will be federally funded through the grant, the project will receive state and local funds—including proceeds from Measure R, a half-cent sales tax hike approved by Los Angeles County voters in 2008—in order to complete the project. Anyone interested in a full breakdown of where the funding is coming from can find it at the Streetsblog Los Angeles story on the FTA’s announcement. And for those curious about the Purple Line’s westerly expansion: FTA Administrator Therese McMillan noted that the “Subway to the Sea” will soon reach a $1.25B funding agreement later this year that will further its extension.